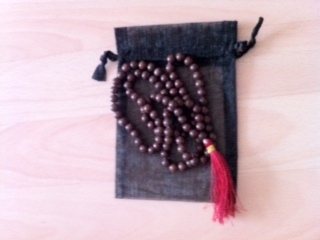 Tradition holds that the correct way to use a mala is with the right hand, with the thumb flicking one bead to the next, and with the mala draped over the middle finger. The index finger represents ego, the greatest impediment to Self-Realization, so it is considered best avoided (as with the ego) when chanting on a mala. 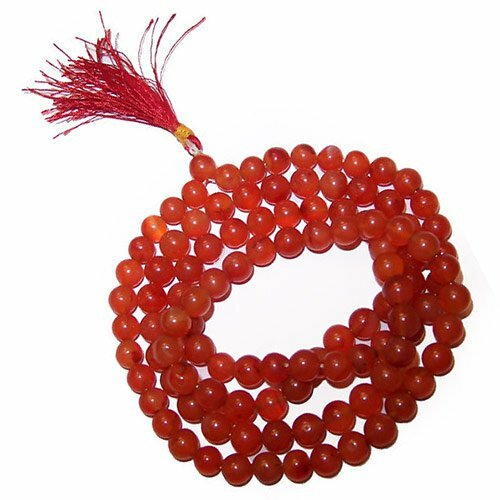 You can also use the mala bead to tune into the essential vibration of a particular mantra moment to moment and breath to breath as a focus for meditation. Allow the energy of this ancient sound formula to bathe every cell of the body. Then sit silently for a few minutes, feeling the vibrations fade into deep inner peace. Red Jasper is known as the 'supreme nurturer'. It sustains and supports during stressful times. It is gently stimulating, grounding and absorbs negative energy, balances yin and yang and stimulates the Base or Muladhara Chakra. 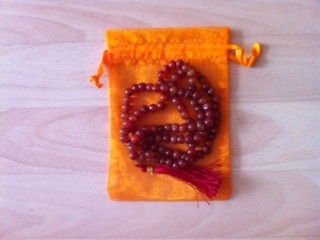 Carnelian is a stone that grounds and anchors you in reality and so stimulates the base or sacral chakra. It is a stabilising stone, offering courage and dispels apathy. It improves analytic abilities and removes extraneous thoughts in meditation. It is a small translucent stone, often water worn or tumbled.